PARIS — NASA Administrator Jim Bridenstine will meet with his Russian counterpart next month as an investigation into an air leak in a Soyuz spacecraft docked to the International Space Station continues. In a rare joint statement by NASA and the Russian state space corporation Roscosmos Sept. 13, the agencies said that Bridenstine and Roscosmos General Director Dmitry Rogozin will meet “on or about Oct. 10” at the Baikonur Cosmodrome, linked to the next launch of a Soyuz spacecraft carrying NASA astronaut Nick Hague and Roscosmos cosmonaut Alexy Ovchinin. The two spoke by teleconference for the first time Sept. 12, according to the statement, to discuss the leak in the Soyuz MS-09 spacecraft discovered Aug. 30. That leak was traced to a small hole about two millimeters in diameter in the Soyuz’s orbital module. While initial speculation focused on an impact by a micrometeoroid or piece of orbital debris, Russian officials later said they believe it was caused by someone, either by accident or deliberately. In the statement, the agencies said Rogozin informed Bridenstine of a Roscosmos-led commission to investigate the cause of the leak. “They affirmed the necessity of further close interaction between NASA and Roscosmos technical teams in identifying and eliminating the cause of the leak, as well as continuation of normal ISS operations and NASA’s ongoing support of the Roscosmos-led Soyuz investigation,” the agencies stated. Rumors have swirled, primarily in Russia media, about who created the hole. Over the previous two weeks blame has shifted from the two Russian cosmonauts on the station to workers on the ground assembling the spacecraft and preparing it for launch to, most recently and most bizarrely, NASA astronauts on the ISS. Both Russian and American ISS crewmembers have, in recent days, also dismissed those rumors. “I can unequivocally say that the crew had nothing to do with this on orbit, without a doubt, and I think it’s actually a shame and somewhat embarrassing that anybody is wasting any time talking about something that the crew was involved in,” Drew Feustel, the NASA astronaut who is the current ISS commander, said during a video interview with ABC News Sept. 11. Plans for a meeting between Bridenstine and Rogozin were already in progress prior to the ISS air leak incident. 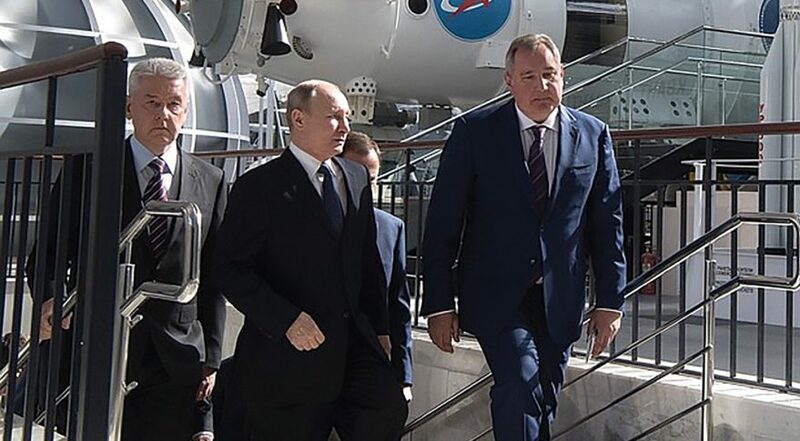 In an Aug. 12 statement, Roscosmos announced that the two planned to meet in October at Baikonur while attending the Soyuz launch. NASA did not confirm those plans at the time.